1 Robert Allenby missed the 2010 USPGA Championship after he slipped on the deck of his boat while fishing in the Bahamas. The 39-year-old Australian tore knee ligaments. 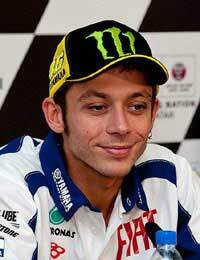 2 World motorcycling legend Valentino Rossi’s attempts to pull the curtains in his home ended in the Italian requiring stitches in his left hand and foot after he fell on to a glass table. 4 The sweet smell of success backfired on hapless Valencia keeper Santiago Canizares when he was forced to pull out of Spain’s 2002 football world cup squad after dropping a bottle of aftershave on his foot. The perfume bottle smashed and a shard of glass severed a tendon in his right foot. 5 Liverpool reserve goalkeeper Michael Stensgaard’s dreams of a clean sheet were dashed when he dislocated his shoulder while attempting to store away his ironing board. The injury cost the Dane a year out of the game and his career with the Merseyside football club. 6 “It would have been better if I had run into a wall or had a fight with somebody.” Certainly would. Unfortunately, Sammy Sosa, who hit 545 home runs during an illustrious career with the Chicago Cubs, was forced to pull out of a match because of back spasms caused by sneezing. 7 Wade Boggs of the Boston Red Sox missed seven games after straining his back while attempting to pull on a pair of cowboy boots. 8 Red Sox pitcher Clarence Blethen had a habit of taking his false teeth out to intimidate opposing batsmen, storing them in his back pocket. Unfortunately, he forgot to put them back in one day, and sliding in to second base while fielding, he suffered lacerations to his backside from the dentures. 9 England cricketer Chris Lewis’s desire to be a cut above the rest backfired on the team’s 1993 tour of the West Indies. After shaving his head, Lewis spent the afternoon fielding without the protection of a hat from the fierce heat and ended up with sun stroke. 10 Goalkeeper Richard Wright rued the day he ignored a sign warning players not to practise in the goalmouth at Stamford Bridge. Wright tripped over the sign, twisting his ankle in the process. 11 USA international goalkeeper Kasey Keller was left with plenty to chew over, or rather not, after he knocked his front teeth out while removing a set of golf clubs from the boot of his car. 12 Manchester United and England footballer Rio Ferdinand’s love of television cost him playing time. The Londoner injured knee tendons after resting his feet for several hours on the coffee table while watching his favourite shows. 14 Norway footballer Svein Grondalen got more than he bargained for when he went for a training run ahead of a friendly for the international team. The hapless defender collided with a moose, ruling him out of the match. 15 The professional career of Brentford goalkeeper Chic Brodie was ended by a sheepdog that collided with him after running on to the pitch. “The dog might have been a small one, but it just happened to be a solid one,” said Brodie, who suffered a shattered kneecap as a result of the incident. Why is Sports Massage So Important?